“Thank you, Barry. I discovered you on YouTube, and for the first time in years I got what is meant by water hazard and lateral water hazard. You are very articulate in you explanation of the rules. I must have read this rule a million times, but could not get it; but now I do. So thank you for that.” He was referring to these videos; Relief from Water Hazard, Relief from Lateral Water Hazard. 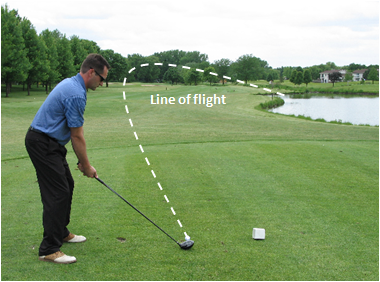 Line of Flight: is the path that a ball takes from the time it is struck until the time it comes to rest. The only part of the line of flight that may be relevant in the Rules is where the ball last crossed a margin, so that the correct place to drop can be determined when taking relief for a ball that is inside the margin of a (lateral) water hazard (Rule 26-1b and c), for a ball that is lost in an abnormal ground condition (Rule 25-1c), or for a ball that is lost in an obstruction (Rule 24-3). Line of Play: is the direction that the player wishes his ball to take after a stroke, plus a reasonable distance on either side of the intended direction. The line of play extends vertically upwards from the ground, but does not extend beyond the hole. The Rules do not provide relief for immovable obstructions on the line of play. Players sometimes think otherwise because they hear TV commentators saying that a player is getting line of play relief. However, this is because tour events have a Condition of Competition affording relief from Temporary Immovable Obstructions (TIOs). Examples of TIOs include, but are not limited to, tents, scoreboards, grandstands, television towers and lavatories. When irrigation sprinklers are located close to a putting green Committees will often introduce a Local Rule providing line of play relief from them. Typically, this is when the ball lies off the putting green, but not in a hazard, within two club-lengths of a sprinkler head that intervenes on the player’s line of play and which is also located within two club-lengths of the putting green. Except on the putting green, a player may have the line of play indicated to him by anyone, but no one may be positioned by the player on or close to the line, or an extension of the line beyond the hole, while the stroke is being made. Any mark placed by the player or with his knowledge to indicate the line must be removed before the stroke is made, Rule 8-2a. Line of Putt: is the line that the player wishes his ball to take after a stroke on the putting green plus a reasonable distance on either side of the intended line. The line of putt does not extend beyond the hole. When the player's ball is on the putting green, the player, his partner or either of their caddies may, before but not during the stroke, point out a line for putting, but in so doing the putting green must not be touched. A mark must not be placed anywhere to indicate a line for putting, Rule 8-2b. The player must not make a stroke on the putting green from a stance astride, or with either foot touching, the line of putt or an extension of that line behind the ball, Rule 16-1e. Line of Drop: is the line on which a player may drop a ball when taking relief from a water hazard or lateral water hazard (Rule 26-1b), or when they have deemed their ball unplayable (Rule 28b). If a player deems their ball unplayable and chooses this option, under penalty of one stroke they may drop a ball behind the point where the ball lay, keeping that point directly between the hole (flagstick) and the spot on which the ball is dropped, with no limit to how far behind that point the ball may be dropped. I hope that this clarifies that the line of flight, which is the actual path of the ball through the air, may be very different from the line of play, which is the intended path of the ball through the air. Usually, the worse the stroke the bigger the difference! If you want to improve your understanding of the Rules of Golf why not join the majority of my regular readers and purchase a personally signed copy of my book, '999 Questions on the Rules of Golf'. I provide questions, answers, references to Rule & Decision numbers and explanatory notes, where necessary. I am confident that this is the easiest way to improve your knowledge of the Rules of Golf. Click here. "We would like to hear your comments on the play we witnessed during team play, and whether it is considered legal play, good strategy or something to be discouraged. Player A is on the green, approximately 3 feet from the hole and is laying 5. Player B is also on the green, but is laying 3 and has a 30 foot putt. Player A putts her 6th shot intentionally back to Player B’s ball, using 4 putts to get to get close to Player B’s ball. Player A now putts toward the hole showing how the green will run. Player A then picks up her ball at 11. Player B then putts to the hole. Player A can then post an 8 on that hole even though she most likely would have had a 6 or 7 at the most. The players putted in this manner on several holes during the 9 hole team play. Our interest in this play is due to the fact that we feel the players in question have had unusually high handicaps for their ability, particularly in the first two months of team play. We would like to know if we should all be playing using their strategy or is this considered bad sportsmanship." Although the 9-hole team play format is not recognised by the Rules of Golf, I have no doubt that the strategy that you describe should not be permitted by the Committee and that the team should be disqualified. I would go as far as to say that the Committee should consider banning the players from future practice for what is obviously a practice that could bring disrepute to the game of golf. Q.In a four-ball competition, a player purposely putts away from the hole to a position slightly farther from the hole than the spot where his partner's ball lies and on the same line to the hole as his partner's ball. The player then putts towards the hole, and the roll of his ball is helpful to his partner in determining how much his putt will break, etc. Is such procedure contrary to the Rules? A.Such procedure is contrary to the spirit of the game. In match play, in equity (Rule 1-4), the player should be disqualified for the hole and, since his action assisted his partner's play, the partner should incur the same penalty (Rule 30-3f). In stroke play, the player should incur a penalty of two strokes and, under Rule 31-8, the partner should incur the same penalty. Could you use rule 33-7 since this is considered a serious breach? If not, then rule 30-3f and 31-8 are two stroke penalties since this is stroke play. And, if it is a two stroke penalty, is it two strokes for each time Player A hit his ball backwards (away from the hole)? I do understand that the penalty applies to both the player and his partner. Only the Committee can decide whether they consider this practice to be a serious breach. In my opinion it is. However, my previous comment that the team should be disqualified was based on your statement that "the players putted in this manner on several holes during the 9 hole team play". I presume that if a 2 stroke penalty was applied to both the player who assisted and the player who benefited each time it happened, the team was unlikely to be in the prizes. The penalty of disqualification is more of a statement that not only is the practice against the Rules it is also totally acceptable.